Got snow? Got an ATV? Somebody did, and ATV snowblowers were what happened after a few brainstorming sessions. Now there are enough of them that we need this buyers guide. We don't want the snow to melt while you read this, so we'll get right into it. You'll find out what's out there, get answers to some common questions, and learn some money saving tips. Typical snowblower mounted on an ATV. Check out the video for a good idea of how atv snowblowers work. Front mounted winch is required. What kind of ATV do you need? Almost any ATV will work, even the smaller 2 wheel drive ATVs. Most of the snowblowers will mount to any of the popular 4 wheeler models. If you have deep snow or rough terrain to deal with, a mid size 4x4 ATV with an engine around 500cc and an automatic CVT transmission would be better, if not necessary. A front mounted winch is required with most atv snow blowers. You might need ATV tire chains for really rough going. What features are best on the snowblowers? We like the mounting systems that run from the rear hitch with an under ATV support that runs from the rear to the front of the 4 wheeler. These put very little weight on the front of the ATV. Dash or saddle mounted remote controls. You'll appreciate those fingertip controls when you're working on a case of frostbite. Correct size auger and engine for the job. A 12 inch auger and 11 hp engine are good for lighter snow. You man need to move up to a 15 inch auger and up to a 23 hp engine for deeper or hard packed snow. Wheels on casters or at least sturdy skids that support the weight of the snowblower. Makes maneuvering a lot easier. The right width of snowblower for your needs. A long driveway or street can be cleared with fewer passes the wider the blower. Narrower walkways or paths with obstructions would need a narrower model. For more details - see which features make the best snowblower for ATVs. Saddle mount control is easier to use. ATV snowblowers that dismount quickly are handy if you want to use your 4 wheeler for other things - like fun. Make sure the snow blower will fit your ATV. Check with the manufacturer for your specific make, model, and year. Check around your community for others who could use a snowblower. They could be willing to pay for your services which would help pay for the equipment. Ask your local ATV dealers for recommendations. Chances are good they know what works the best with your particular 4 wheeler. Agri-Fab has a 50 inch snow blower with 11 hp engine. Bercomac offers models from 48 to 54 inches wide that fit both UTVs and ATVs. 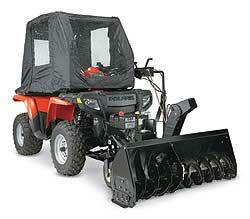 DR Power Equipment includes this snowblower in their extensive line of ATV powered attachments. 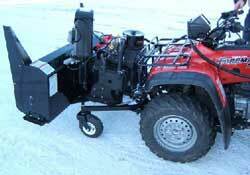 Snow Hogg is a new player with a 42 inch 2 stage snowblower that uses a 13 hp Honda engine. Some four wheeler manufacturers offer their own line of blowers - like the Polaris ATV snowblowers. Factory warranty and dealer installation could be an advantage to those models. Top features of a snowblower for ATVs. - Find out what makes the best snowblower for ATVs. 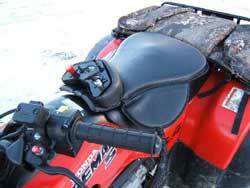 Return to ATV Accessories Guide from ATV Snowblowers.